Have you ever had a splinter? This tiny thing that all of a sudden becomes the center of your universe? Think of negative thoughts as a splinter in your mind that if left unchecked can consume your consciousness. Welcome back to The Nick Broadhurst Show. I’m your host, Nick Broadhurst. You can catch all of my music and my music videos at iamnickbroadhurst.com. And that song you were listening to is called The One, which I wrote for my beautiful queen, my wife, Melissa Ambrosini. 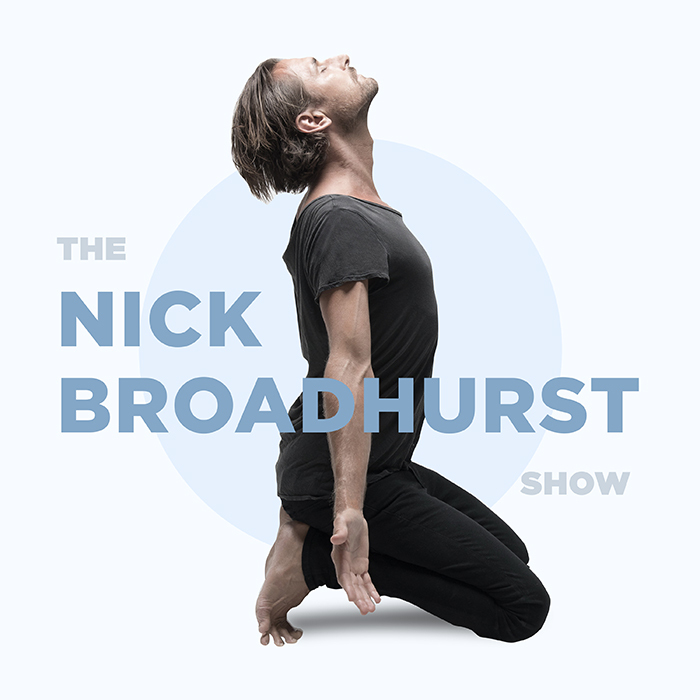 And I’m going to be performing that on my Australian tour, which is called Open Wide, which you can get tickets to at nickandmelissa.com..
Before we jump into Episode 4 of The Nick Broadhurst Show, I’m going to talk to you very quickly about yesterday. So yesterday we started the 21-day negativity detox, which you can catch at iamnickbroadhurst.com/3 if you missed it. And unfortunately for me, I have my hair band on my left wrist, which means I didn’t make it past day one. That’s pretty annoying. But I actually called someone nuts yesterday, and my son said to me, “Daddy, that was negative,” and he’s right. So I’m back to square one today, or square zero, and on day zero of my 21-day negativity detox. So I would love to hear how you’re going. Did you make it past day one? And it’s not easy, hey? It’s not easy. So tag me, let me know. You can use the hashtag #21daynegativitydetox, and tag me @IAmNickBroadhurst on any of the social media platforms. And it brought up a really good point. Someone private messaged me yesterday and said, “Hey, but what about negative thought?” And it’s a really good point because I didn’t talk about negative thoughts yesterday. And it’s one of those things that’s very hard to police. I was really talking more about our actions, our negative actions. But the thing is, right, negative thoughts are a serious handbrake, right? They really are. I mean, my wife wrote a whole book on it, Mastering Your Mean Girl. So I want to talk about that today because I think this is something which every single human being on the planet, who’s ever walked the planet, has struggled with this. And there’s actually an incredible — actually, before we go into that, this just reminds me. Yesterday Melissa released a podcast with Dr. Stephen Cabral. And you can get that at melissaambrosini.com/59. Now, this podcast spoke about, well, Stephen spoke about how he can support anyone on the path to recovering their health. Anyone. But, the only people that don’t recover their health are those that just don’t believe that they will one day be healthy. It’s that simple. Right? So negative thoughts, they are a serious handbrake. And I actually came across a concept called pulling the splinter. So today’s episode is called Pulling the Splinter for Peace of Mind. And I came across this from a very good friend of mine, Bhava Ram. Now, I actually came actually came across Bhava on a Ted Talk, and I was so impressed, I just felt compelled to reach out to him. And, luckily, since then, we’ve become famous friends, as well as his beautiful wife, Laura Plumb. They’ve both actually been on the Melissa Ambrosini show. Really beautiful episodes. Definitely worth checking out. And Bhava wrote this incredible book called Warrior Pose, Memoirs of a War Correspondent: How Yoga (Literally) Saved My Life. If you have not read that, I absolutely cannot recommend it highly enough. I couldn’t put it down. I read it in two sittings. And to be perfectly honest with you, it’s one of those pivotal life-changing books. Well, it was for me anyway. And since I’ve recommended it to a lot of people, I’ve had the same sort of feelings come back about that book. So definitely check it out. I’ll put that in the show notes for you. But, as I was saying, Bhava introduced me to this concept of pulling the splinter. Okay, so have you ever had a splinter? Just, you know, you might have run your hand over some timber, and you get that little annoying splinter in your finger. This tiny little thing can all of the sudden become the center of your universe. It wasn’t there a second ago, and now it’s consuming you. Now, think of negative thoughts as a splinter in your mind. Okay? And if left unchecked, can totally consume your consciousness. Now, if you’ve got a splinter in your finger, what would you do? Would you just leave it there? I mean, the body can potentially push it out. And this could happen with thoughts, they may resolve themselves naturally. But, most like, that splinter is going to fester and get infected if you leave it in there. And negative thoughts are no different. If you leave that negative thought, that splinter, in your brain, what’s going to happen to it? Okay? If you leave it unchecked, it can consume, completely consume, our consciousness. Now, there’s an ancient vedic text called the Yoga Sutras by Patanjali. And in that, he talked about a practice called Pratipaksha Bhavanam. Did you like my pronunciation? It was a very fancy vedic pronunciation. I hope I got it right. And it reads that, “When disturbed by negative thoughts, opposite (or positive) ones should be thought of.” Okay? So a personal example for me would be something like when I was on my healing journey, and we’re always, I guess, on a healing journey of sorts, but I used to, sort of, say to myself — and this is really stinky — I used to say to myself, “I’m never going to get better. I am never going to just be full of energy every day.” This was my splinter. Such a stinky splinter. That one festered so much. And what would you do? So the process of pulling the splinter is really simple. As soon as you catch yourself with one of these negative thoughts, you just bring in the opposite. It’s that simple. Right? So in that case, I could say something like, “I am strong. I am healthy. I am calm.” And that’s actually, I’m strong, I’m healthy, I’m calm, is a mantra that I got from Warrior Pose, Bhava Ram’s book which I just mentioned. It’s so simple, guys. Like, when I first implemented this, it just instantly transformed my own personal relationship with my, in my mind. I realized that I actually had the power to turn things around in an instant. Right? And you can probably just already feel that energetic shift, just by hearing it, just when I said it. And that wasn’t even your own splinter, it was mine, but you probably felt that energetic shift. Right? So I want to encourage you to try experimenting with pulling the splinter. Okay? And feel free to tag me whenever you like. Use the hashtag #BroadNewWorld. And across all social media, you can catch me @IAmNickBroadhurst. And I want to hear from you, so please do use that tag. And for all the show notes today, you can go to iamnickbroadhurst.com/4. And I just want to say thank you so much for being here, I absolutely adore you, and I love doing this show. It’s so much fun, and I don’t know why I didn’t do it earlier. What was I waiting for? Seriously. If there’s something that you have wanted to do, and you’re putting it off, then perhaps this can be the little spark that might nudge you in the right direction to take that first step. Whatever that first step is that you need to take to start doing that thing you love, why don’t you take it today? It could be something tiny, but at least it’s a first step. Now, of course, I would love it if you left me a five-star review. If you genuinely feel like it’s worthy of five stars, please head to iTunes and leave me a review. I would love to hear thoughts anyway. So please do tell me on iTunes exactly what you love about this show, what you would like more of. That feedback would be really supportive for me. And you can also leave that review directly from your phone as well. So thank you again for being here. I love you heaps. And have an amazing day. I would love to hear from you, so please tag me @IAmNickBroadhurst on social media, and use the hashtag #broadnewworld, or leave me a comment below ( I read every single one!) Thank you for being here! And as always, listen to your intuition (and maybe your Dr because I have to say that) when implementing any new practice into your life.